The DTR650 radio is a unique radio that offers many advanced features found in higher tier radios at a lower price. This radio does not require an FCC license for operation. DTR650: Digital, Clear and License Free! The DTR650 operates at 900 MHz with enhanced communication options such as Digital One-to-Many Calling (Public Group Call and Private Group Call), to allow mass notification in one transmission. The Radio also provides exceptional performance, pristine digital clarity, and offers a greater area of coverage up to 350,000 square feet. With longer battery life and digital audio quality that is clean and crisp within coverage areas, the DTR650 is the clear choice for on-site communication. It also has advanced message capabilities, with the potential to transmit 25 available and 10 preprogrammed messages, for quick communications in situations when voice/audibles are not possible. The DTR650 series was designed for many different applications and situations, one of them being small businesses. With this radio, digital on-site communication for small businesses has never been easier. The wide area coverage, crisp audio, and programmable features make it a great choice for all types of professions. Whether you're a principal, plant supervisor, security officer or retail professional, you can rely on the DTR650 radio to boost productivity, cut downtime and strengthen service. Use the following downloads to learn about the operations, specification and programming of the DTR650. If you have any questions, feel free to call us at 1-800-396-1911. One of the best features of the Motorola DTR650 Digital Radio is the ability to selectivly call a single radio and have a private conversation. A private-call recipient will receive an audible alert or vibrating signal with the sending units callers ID displayed. Use Groups and Channels to make group calls. This can be a public channels allowing for dynamic groups of users that make this channel selection; or private groups of users pre-programmed for private calls. Caller ID displays group identification. Make a public "All Call" to every DTR650 radio programmed for your organization. The call recipient will receive an audible alert or vibrating signal with the sending units callers ID displayed. The DTR650 comes with free programming software so that you can utilize all of the great features. 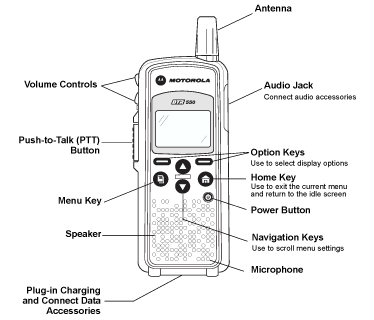 We at Amerizon understand that you may want to know how to program your own radio, so we have created the Motorola DTR650 Programming Guide. Click the video and learn exactly how to program your new radio! The DTR650 accessory jack is made for a connection that won't come out. It also has a rubber dust cover that sometimes gets in the way. Watch our video about properly connecting the accessory to this unit. This may be the solution to your issue.